The smart shutter technology enables you to make an adaptive image capturing system, controlled automatically by software. Effective range is up to 20 meters (65 ft) but it may vary depending on the specific environmental conditions. Ideal for both moving traffic (motorways, enforcement, congestion, etc.) and access control (parking management) applications. 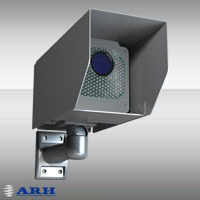 There is no disturbance for drivers, as the IR illuminator works at an undetectable bandwidth for human eyes.